For the past nine years, the Harrington Park School District has worked toward a goal of developing the leaders of tomorrow, through a deliberate and strategic program to place students in opportunities where service leadership is infused into their daily lives. One effort is Project Pride. Through Project Pride, students use what they learn in the classroom, as well as through other designated activities, to solve real-life problems. They develop responsibility, establish community partnerships, and become contributing citizens and community members through the service they perform. Project Pride entails mutual engagement of staff, utilizing the best practices of transformational curriculum design and leadership. One of the key activities for students is the “Reverse Inclusion” program, where Harrington Park students and children from a neighboring autism program share lunch two days per week. In addition to lunch, students have recess time to practice socialization skills and enjoy each other’s company. Students from the program are also invited to take part in a monthly coffeehouse program. 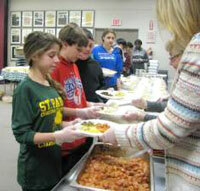 The Harrington Park students also visited Hebrew Union College in New York City to serve people in need. Another project teams up Harrington Park students with United Water. Through this program, students travel to a local reservoir where they fill up bag after bag with garbage and other recyclable materials. This activity, along with the others, is open to all students. In 2012, Harrington Park received the prestigious “Jefferson Award,” a national recognition that rewards student public service projects. Project Pride embodies the core vision of the Jefferson award as it inspires, energizes and engages students in the development of an important idea: What one does in this life is bigger than oneself.